Up on the roof: many clients use wireless connections to get in and out of the data centre. Just over a week ago, Johannesburg-based Teraco announced that it had hit an African record: thanks to some new contracts it had signed over the last few months, it said that peak traffic through its NAPAfrica internet exchange – the open peering node where different networks can interconnect – had hit a whopping 15Gbps. Even more impressive is the fact that NAPAfrica is only two years old. And Teraco itself dates back just six years. To put its achievement in some perspective, the 18-year-old Johannesburg Internet Exchange – the Rosebank-based previous holder of the title since – generally hits around 10Gbps or more peak traffic. Traffic for the last day on JINX. While on a normal Monday, traffic through NAPAfrica is hitting around 13Gbps. And elsewhere in Africa, the Cairo Internet Exchange does just under 1.5Gbps at peak and the East Africa Exchange Point in Nigeria does just under 1Gbps. Of course, there’s still some way to go. The mighty Deutscher Commercial Internet Exchange in Frankfurt, Germany handles just over 100 times the amount of traffic as Africa’s busiest exchange. But you know, it’s a start. More importantly, we wanted to know how Teraco has managed to grow so far so fast. So we went along to its Joburg HQ to find out. The massive datacentre building at the heart of the Teraco operation is in Isando, a stone’s throw from Oliver Tambo Airport. This, says CEO Lex van Wyk, gives the outfit the advantage of being on the same electricity grid as the airport itself, which gives its power supply as level of stability that it might not otherwise enjoy in Johannesburg. 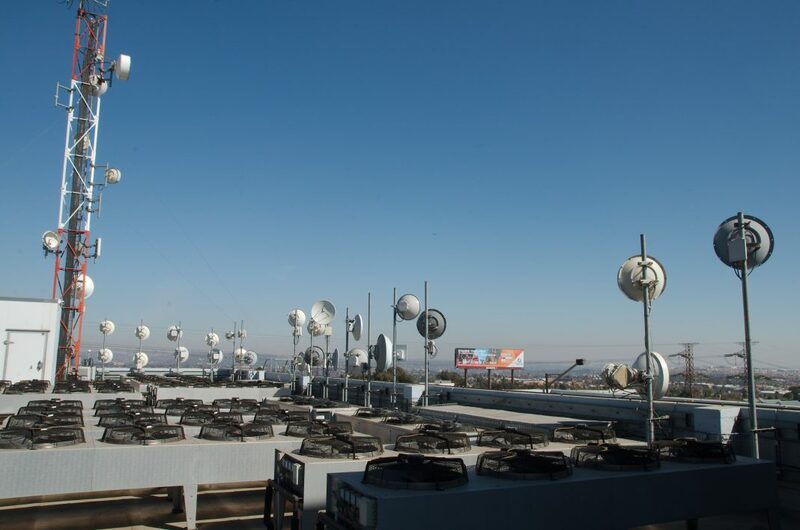 Teraco’s business development manager Michelle McCann says there are other benefits to the location too: the roof is festooned with wireless antenna equipment which enjoys line of sight to Joburg CBD. It’s become a prime location for Teraco customers to rent a bit more space for extending their networks. The rooftop provides LOS to downtown Joburg. 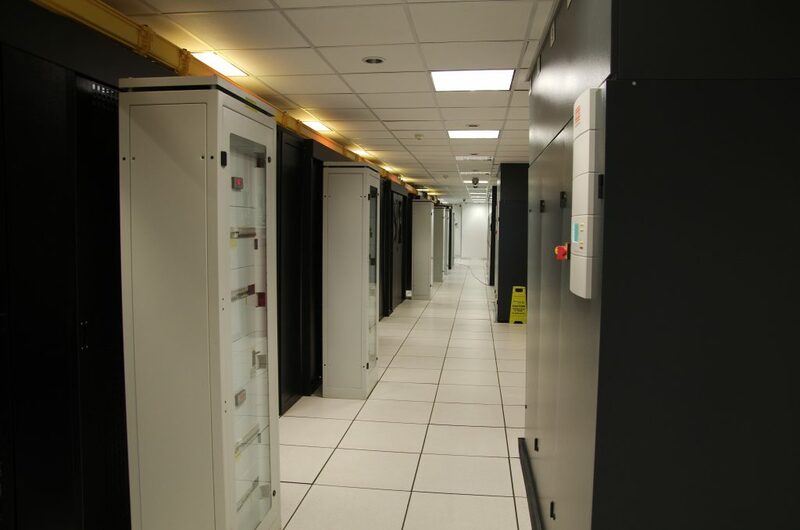 Teraco’s Joburg datacentre is unique in Africa. Not only is it massive – at almost 4 000 square metres spread over four floors with another 6 600 planned for expansion van Wyk believes it’s the largest single datacentre on the continent – it’s also a neutral supplier of services. What that means is that unlike other large datacentres Teraco doesn’t offer networking or hosted services: it owns space, and lots of it. Customers can rent floor space and cabinets, and Teraco has 99.999% SLAs on power provision and cooling, but it’s completely agnostic when it comes to what goes on inside a customers’ cabinets. One grilled door I pass suggests that at least one customer uses the very expensive floorspace as overflow storage. Instead of server racks, there’s an old PC and monitor inside. As far as Teraco is concerned its responsibility ends at the cabinet door. Many customers cage off areas inside the datacentre, with extra layers of biometric security on the gates. Much of the space in DC4 is still waiting to be used, although McCann reckons it won’t take long to fill. The original two floors are completely full. A second building is being planned in the same business park. That’s left the company to focus on two core roles. Firstly, it’s very secure. van Wyk claims that it is the only independent datacentre in the country to be PCI-certified and POPI compliant, so it can be home to banking servers and a highly prestigious SSL certificate server – one of the core parts of internet infrastructure that underpins online encryption. Secondly it’s really well connected. There’s direct routes to 55 countries through the fibre cables that connect the Teraco data centre to its satellite sites at Cape Town and Durban, and almost every service provide operates a POP here. “Every undersea cable ‘lands’ here,” van Wyk says. 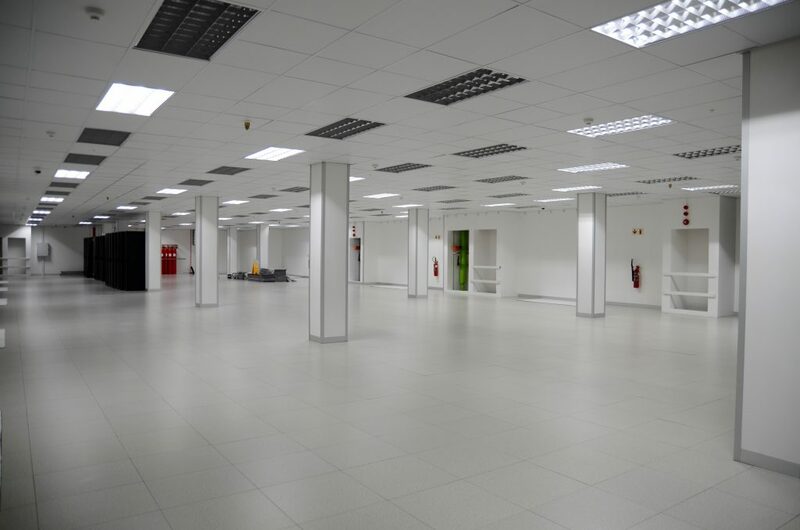 Business Connexion, which operates South Africa’s largest data centre network by far, also has a POP in the Teraco building to be close to international traffic. Undersea cables ‘landing’ in the middle of Gauteng. Growth has focussed around the presence of the NAPAfrica exchange. 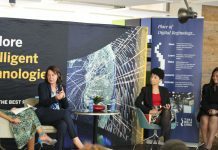 van Wyk and McCann have focussed on attracting big name international content providers to rent space inside the Teraco building, and then encouraging local firms to physically connect here too, thus benefitting from the low latency of a local network at the exchange. 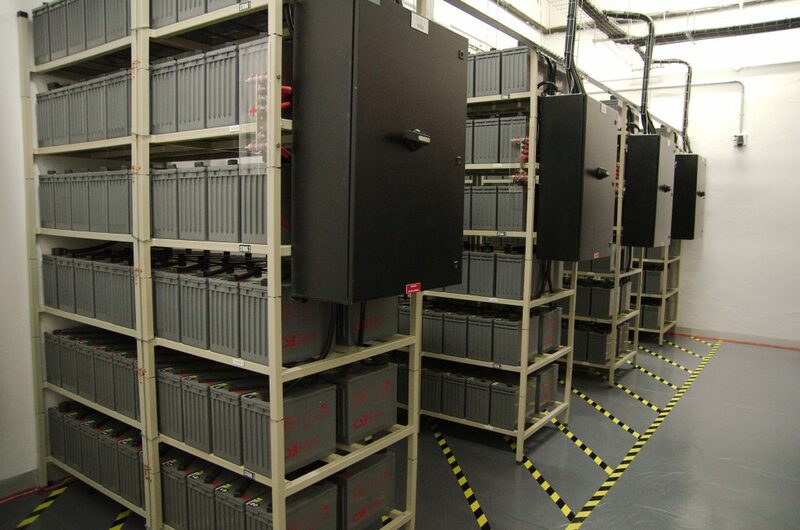 Banks of batteries give the building 20 minutes of backup power before the diesel generators kick in. 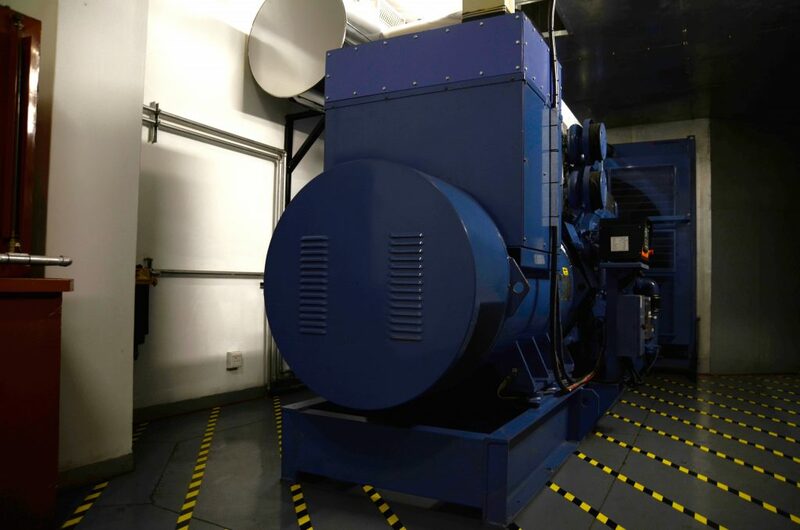 There are three identical power plants for back-up power at the Teraco building. Each generator has 1 000 litres of diesel inside and there’s a 40 000 litre tank outside. The longest they’ve run for so far is two days, following problems with cable theft in the area. It’s best known client we can talk about is Akamai, the cloud company that hosts Apple’s multimedia content and the BBC’s iPlayer streams, but there are other logos present here to that we’ve been asked not to name. 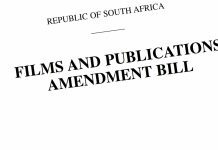 van Wyk describes them as “five of the top six” content providers in the world. 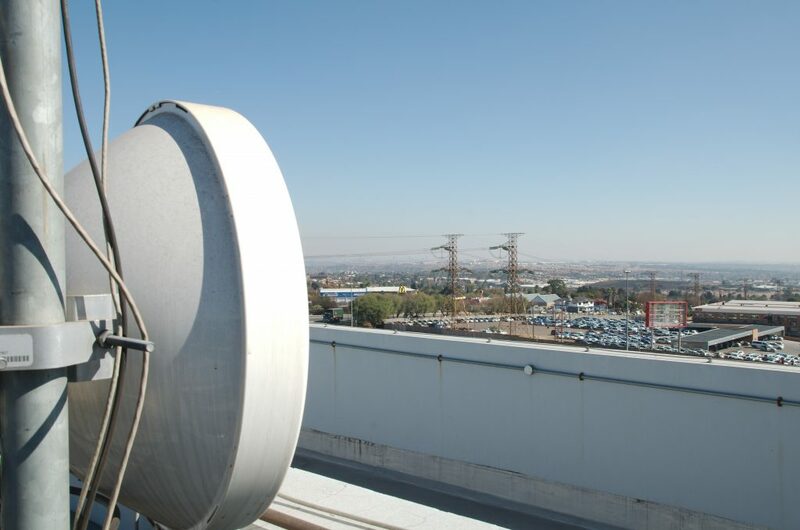 Pretty much every major South African network – including DSTV, Business Connexion and Telkom – also rents space so that they can peer into these services over NAPAfrica and thus reduce bandwidth costs. Reducing costs through colocating servers is a big part of Teraco’s appeal says van Wyk. 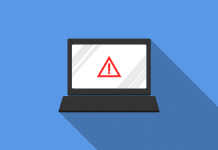 As the price of a new data centre increases – particularly around security requirements. Small businesses are a big area of growth at the moment as they’re looking to colocate IT infrastructure and reduce costs. 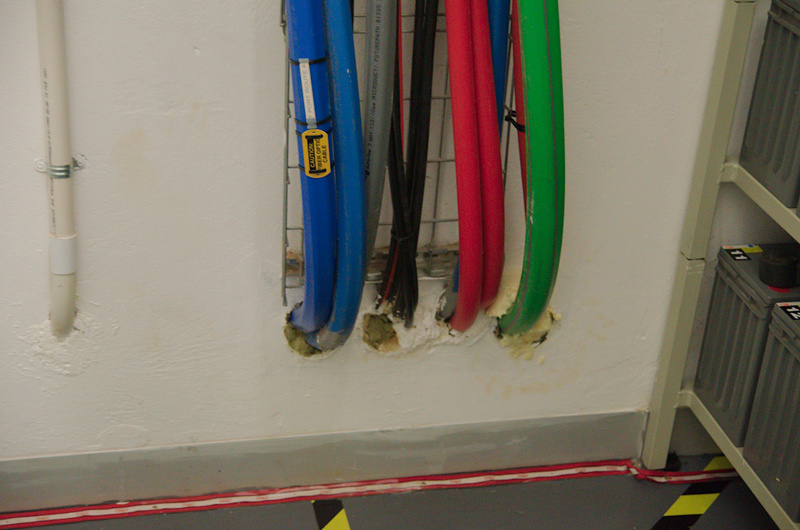 McCann reckons there are some 150 new interconnects being made inside the data centre every month, and the current total is around 3 600. One noticeable result of Teraco’s relatively recent entry into the market is that cooling inside the datacentres is pretty advanced. Air conditioning is the single biggest cost in a data centre, and huge strides have been made over the last few years in data centre design to make airflows more efficient and do away with old-fashioned air-con in favour of water cooling and “free air” cooling. Even between floors here there’s a distinct drop off in noise levels as the cooling systems get a couple of years younger and more sophisticated. Perhaps the biggest surprise, however, is that between this installation and two smaller sites in Cape Town and Durban Teraco only employs 67 people, which is a tiny amount for the scale of the operation. That said, there are plenty more outsourced workers inside the building, including security staff and, most notably, the small army of cleaners who do daily rounds cleansing every floor of potential dirt. 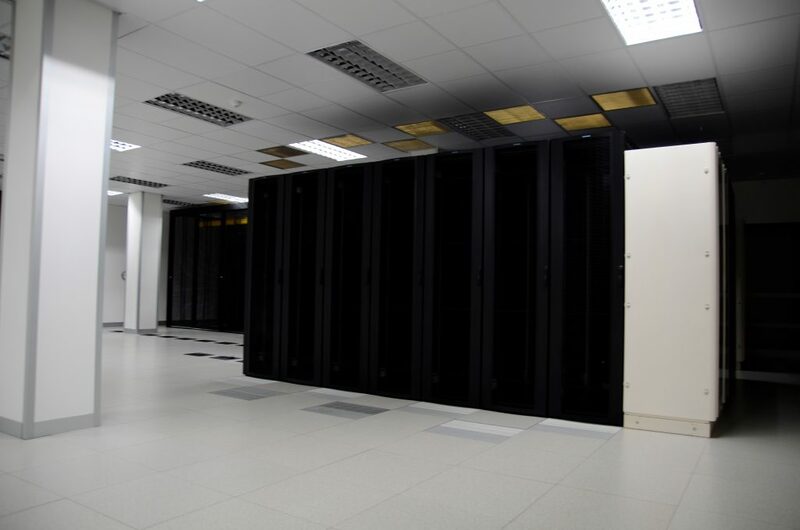 Teraco is just one of several large datacentre operators in South Africa. If you’re interested, check back next week to find out more. 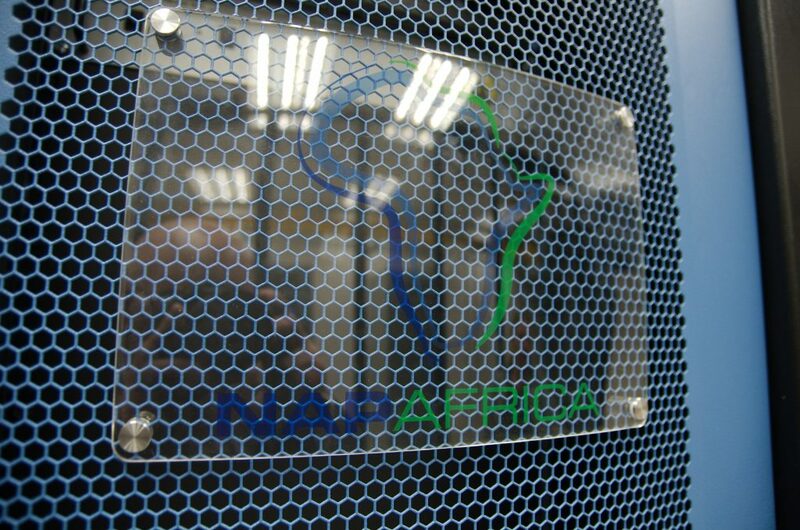 NAPAfrica is busiest internet exchange on the continent. Adam is the Editorial Director at htxt media. He has been writing about technology for almost two full decades now. 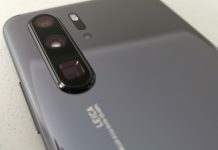 In a previous life, he was the editor of PC Format and Digital Camera Shopper in the UK, before going on to work as a freelance journalist for seven years. 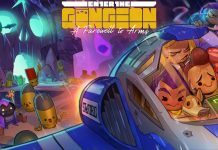 His work has appeared in or on Stuff, The Guardian, Linux Format, TechRadar, Wired.co.uk, PC Gamer, Green Futures, The Journalist, The Ecologist and The Review. Adam moved to South Africa in 2012 and loves 3D printers, MakerFairs and tech hubs. He hates seafood. None of his friends remember this when cooking. 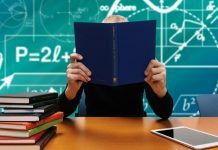 Data Privacy – Should your business be afraid of PoPIA and GDPR?